Mark Flanagan is a former writer for ThoughtCo who wrote about contemporary literature for more than 12 years. Mark is the founder and book review editor for RunSpotRun.com, a website dedicated to providing timely and unbiased reviews of fiction and nonfiction literature. 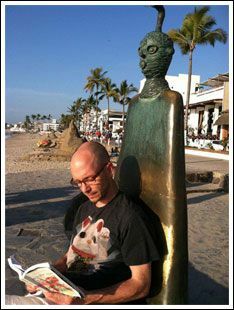 Mark is also the founder of InfiniteWinter.org, a site devoted to all lovers of books and writers. His articles and reviews of contemporary literature appear in numerous newspapers and magazines, and he has been a regular contributor to Kirkus Reviews. Mark has written customer-specific content for marketing, advertising, newsletters, and websites for more than 24 years. Mark Flanagan earned a Bachelor Arts (B.A.) in English Education from the University of North Carolina–Chapel Hill in 1990.
Who Is Writer Anne Lamott?